Welp, there goes my head. It just like. Exploded. I'm typing this as a decapitated corpse. I am actually more interested about what kind of reaction Keiji had when they told him about this. I like to imagine that he probably laughed to tears about the idea or that he just simply ignored it and is now seeing the news and just going "wtf" over it. Which is more offensive? A Jewish Pig or Dating your Uncle? I think the name was just intended to sound germanic, it's a count after all, Japanese people might just not pay attention to the specific choice of word. The "Harem anime" actually sprang out of the popularity of Dating Sims in Japan. Dating Sims directed at girls exist as well but are less common. There are quite a few dating sims and things directed at girls, called Otome games. I've played quite a few of them, they are good games, a particularly great one called "Hakuoki: Demon of the Fleeting Blossom" for the PSP, it's more a visual novel than a dating sim though. 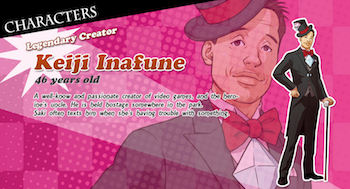 Looking through the site it doesn't look like Keiji Inafune's actually dateable, he's just someone you gotta rescue. On the other hand there might be some ridiculous secret route to date him anyways.